I can vividly recall my first encounter with a design by Ulla Johnson. It was thanks to a favorite customer of mine, and one as gracious as she is stylish. She floated into the shop in delicate blush, and I knew I had fallen in love with Ulla’s creations that day. Fortunately, a trip to New York was in the plans, and happily, not so long after Ulla opened her premier shop. Ulla Johnson launched her eponymous brand shortly after her finishing her schooling, in 1998—where she studied both women’s studies and psychology. Although not directly related perhaps, her education no doubt has played a role in her business ethos, and one that ought to be appreciated. Not only does Ulla design for women in mind, but her pieces are created by women—and many of which have been empowered, valued and celebrated for their craft. Indeed, Johnson’s pieces, many of which include handmade details, promote not only beauty but substance—something that (sadly) not always practiced within the fashion industry. Tucked within the Noho neighbourhood, admittedly, it was an area I hadn’t explored beforehand, but was delighted to. Ulla chose this neighborhood for a few reasons, but one, and my favorite, is that the area offered more trees and bits of nature. She had kept it in mind years previous, and happily, found the perfect spot to open her very first shop. On that particular day that we first visited, the sun tucked in and out of buildings, creating the most romantic, cheerful scene just outside of Ulla’s shop—though it was certainly in need of no assistance in that department. The coppery exterior was graced with two, gently weeping cedar trees and bold planters that perfectly framed the ever-dreamy, simple, yet intriguing window displays. 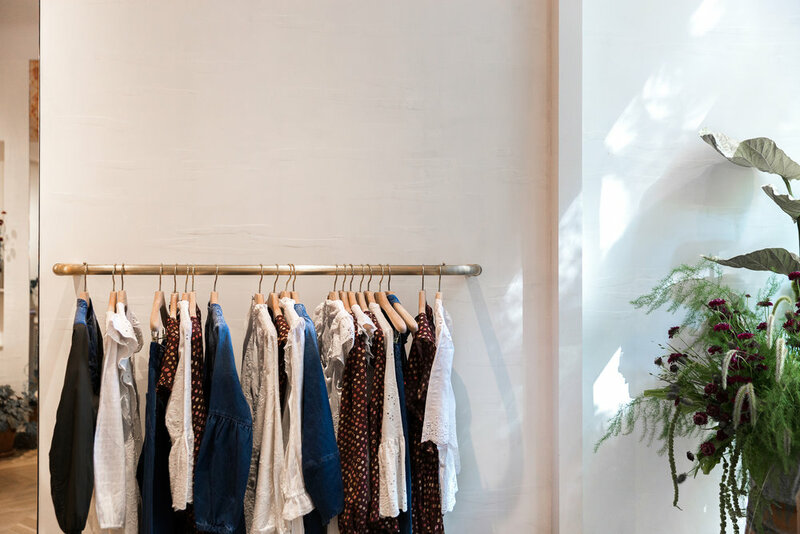 Inside, we were met by the loveliest lady working there that day, suggesting that truly every layer of Ulla Johnson—from the enchanting exterior characteristics, through to the inside, and into the pieces themselves—were warm in their own regard. Beginning most of her work days at about 6:00am, I wonder what a typical day might look like for this devoted mother first, (I dare say) and wildly successful, business woman. And although I haven’t had the pleasure of meeting this inspiring woman in person, yet, I have a feeling that she is somewhat like her pieces—incredibly thoughtful, beautiful and special. A few additional tips: Ulla truly enjoys collaborations, and recently joined with Bobbi Brown to create a wonderfully complimentary makeup collection. Also, if you are locally located in Vancouver, Canada, you can also visit Rebecca Bree to purchase Ulla Johnson pieces.